Crime and Punishment  is a novel by Russian author Fyodor Dostoevsky. It was the first great novel of his mature period. It was first published in the literary journal The Russian Messenger in 12 monthly series in 1866. It was later published in a single volume. It is the second of Dostoevsky's novels, written after he returned from his punishment (exile in Siberia). Crime and Punishment is about the troubles of Raskolnikov, a young man living in St. Petersburg. He used to be a student, but he became so poor he had to stop studying. He plans to kill a selfish old pawnbroker for her money, and he acts on his plan. Raskolnikov argues that with her money he can do good things, and that he was simply killing a person who was not worth anything. He also murdered her to test his idea that some people are naturally better than others and have the right to murder. Several times in the novel, Raskolnikov justifies himself by comparing himself to Napoleon, saying that murder is allowed for a higher purpose. However, after he kills the pawnbroker, questions which he cannot answer and feelings he had not expected terrify him. He feels separated from mankind, nature, and truth. Because of this, he decides at last to confess to the police and accept suffering. Dostoevsky began the idea of Crime and Punishment in the summer of 1865. This was after he had gambled away much of his money. Because of this, he could not pay his bills or eat properly. He owed large sums of money to creditors, and was also trying to help the family of his brother Mikhail. Mikhail had died in early 1864. He began writing it under the title The Drunkards. He wanted to write about "the current problem of drunkenness". However, when Dostoevsky began writing about Raskolnikov's crime, the theme of crime and punishment became his main subject instead. Dostoevsky offered his story to the publisher Mikhail Katkov. At the time, he did not think of Crime and Punishment as a novel. Famous writers such as Ivan Turgenev and Leo Tolstoy often used Katkov's monthly journal, The Russian Messenger, to print their writings. Dostoevsky, though, had argued with Katkov in the early 1860s, and had never printed anything in the journal. Finally, Dostoevsky asked Katkov for help when others would not print his book. In September 1865, Dostoevsky wrote a letter to Katkov. In the letter, he explained to him that Crime and Punishment was going to be about a young man who believes in "certain strange, 'unfinished' ideas, yes floating in the air". He also said that he wanted to study the moral and psychological dangers of "radical" ideas. In letters written in November 1865 an important change had happened: the "story" has become a "novel", From then on, Dostoevsky always spoke of Crime and Punishment as a novel. Dostoevsky had to write very quickly to finish both The Gambler and Crime and Punishment. Anna Snitkina, a stenographer whom he later married, helped him very much. The first part of Crime and Punishment appeared in January 1866 in The Russian Messenger. The last part was published in December 1866. When Dostoevsky's complete writings were published in the Soviet Union, the editors put together the notebooks that Dostoevsky kept while he was working on Crime and Punishment and printed it. They printed the notebooks in the same order as the book was written. Through their efforts, there is now a small part of how Dostoevsky first imagined Crime and Punishment to be written. There are also two other versions of the story. They are called the Wiesbaden edition, the Petersburg edition, and the final (last) plan. A part of a change in the story was that instead of the story being told by a character inside it, it was written as if many uninvolved people were writing it (this was a form of writing that Dostoevsky made up). The Wiesbaden edition is mostly about the reaction of the writer to his murder. It is quite similar to the story that Dostoevsky described in his letter to Katkov, and was written like a diary or journal. It had the same story as what later became part II. Raskolnikov is a mentally insecure student who has stopped going to university. He lives in a very small, rented room in Saint Petersburg. He does not let anyone help him, not even his friend Razumihin. He plans to kill and steal money from an old pawnbroker and moneylender, Alyona Ivanovna, but it is not clear why he wants to kill her yet. 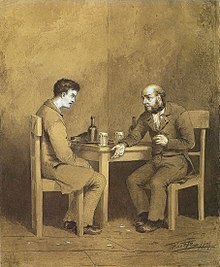 While he is thinking about this plan, Raskolnikov meets Semyon Zakharovich Marmeladov, a sad drunkard who recently spent all of his poor family's money on drinking. He also gets a letter from his mother. His mother says that she will soon visit St. Petersburg. She writes about his sister's sudden engagement, saying that they will talk about it when they arrive. After thinking, Raskolnikov goes to Alyona Ivanovna's apartment. There, he murders her with an axe. Her quiet half-sister, Lizaveta, comes inside. Surprised, Raskolnikov quickly kills her, too. Frightened by what he has done, he leaves most of Alyona Ivanovna's wealth behind, only stealing a few things and a small purse. He then runs away without being seen by anybody. After his murder, Raskolnikov is filled with worry. He hides the things he stole under a rock and tries to clean away the blood from his clothes. After a short visit to his friend Razumihin, he becomes sick with a fever and seems to wish to betray himself. Whenever anyone speaks of the murder of the pawnbroker, he acts strangely. ↑ Frank (1995), p. 96. ↑ Dostoevsky, Fyodor (2008). Memoirs from the House of the Dead. Great Britain: Oxford University Press, Inc. ISBN 978-0-19-954051-8. ↑ 4.0 4.1 "University of Minnesota - Study notes for Crime and Punishment". www1.umn.edu. Retrieved 13 June 2010. ↑ 5.0 5.1 "Crime and Punishment Study Guide: About Crime and Punishment". gradesaver.com. Retrieved 13 June 2010. ↑ Dostoevsky first wanted four first-person plans: a memoir written by Raskolnikov, his confession recorded eight days after the murder, his diary begun five days after the murder, and a mixed form in which the first half was in the form of a memoir, and the second half in the form of a diary (Rosenshield , 399). Bourgeois, Patrick Lyall (1996). "Dostoevsky and Existentialism: An Experiment in Hermeunetics". In Mc Bride, William Leon. Existentialist Background. Taylor & Francis. ISBN 0-815-32492-8. Cassedy, Steven (1982). "The Formal Problem of the Epilogue in Crime and Punishment: The Logic of Tragic and Christian Structures". Dostoevsky Centenary Conference at the University of Nottingham. 3. International Dostoevsky Society. Church, Margaret (1983). "Dostoevsky's Crime and Punisment and Kafka's The Trial". Structure and Theme – Don Quixote to James Joyce. Ohio State University Press. ISBN 0-814-20348-5. Davydov, Sergei (1982). "Dostoevsky and Nabokov: The Morality of Structure in Crime and Punishment and Despair". Dostoevsky Centenary Conference at the University of Nottingham. 3. International Dostoevsky Society. Gill, Richard (1982). "The Bridges of St. Petesburg: a Motive in Crime and Punishment". Dostoevsky Centenary Conference at the University of Nottingham. 3. International Dostoevsky Society. Hardy, James D. Jr.; Stanton, Leonard J. (1999). "Introduction". Crime and Punishment by Fyodor M. Dostoevsky. Signet Classic. ISBN 0-451-52723-2. Jahn, Gary R. "Dostoevsky's Life and Career, 1865–1881". University of Minnesota. Retrieved 2008-08-24. McDuff, David (2002). "Introduction". Fyodor M. Dostoevsky's Crime and Punishment. Penguin Classics. ISBN 0-140-44913-2. Morris, Virginia B. (1984). "Style". Fyodor M. Dostoevsky's Crime and Punishment. Barron's Educational Series. ISBN 0-812-03409-0. Ozick, Cynthia (24 February 1997). "Dostoevsky's Unabomber". The New Yorker: 114. http://www.newyorker.com/archive/1997/02/24/1997_02_24_114_TNY_CARDS_000378325. Retrieved 2008-08-17. Rosenshield, Gary (winter 1973). "First- Versus Third-Person Narration in Crime and Punishment". The Slavic and East European Journal 17 (4): 399–407. doi:10.2307/305635. https://www.jstor.org/pss/305635. Retrieved 2008-07-28. Rosenshield, Gary (1978). Crime and Punishment: The Techniques of the Omniscient Author. Peter de Ridder Press. ISBN 9-031-60104-7. Sergeyev, Victor M. (1998). "Moral Practices and the Law". The Wild East: Crime and Lawlessness in Post-communist Russia. M.E. Sharpe. ISBN 0-765-60231-8. Simmons, Ernest J. (2007). "In the Author's Laboratory". Dostoevsky – The Making of a Novelist. Read Books. ISBN 1-406-76362-4. Wellek, René (1980). "Bakhtin's view of Dostoevsky: 'Polyphony' and 'Carnivalesque'". Dostoevsky Studies – Form and Structure. 1. International Dostoevsky Society. Dual Language E-Book - Crime and Punishment English and Russian texts side-by-side (incomplete). Complete Book Summary of Crime and Punishment. This page was last changed on 17 January 2019, at 03:16.